This morning, we rode with our group to visit four war memorials. The first memorial we visited was the World War II Memorial. Before we explored with our group we talked about the different sacrifices needed to be made when our country is in war. After that, we got a chance to tour the memorial. 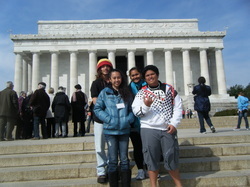 We found the column representing Hawaii, and took a group photo with the students from McKinley High School (from Oahu). Next we walked over to the Lincoln Memorial. With our group, we talked more about the wars. Our group leader asked us to explore both the Vietnam and Korean Memorials and note their differences. The two of us visited the Vietnam Memorial first. There is a long reflecting wall that lists all the names of soldiers who died in or after the Vietnam war. We viewed a statue that, in our opinion, is the saddest one we've seen so far. It depicts a nurse holding a heavily wounded soldier. Someone had placed a white rose in the soldier's hand. The main difference between the Vietnam and Korean Memorial was that the Korean Memorial depicted pictures of the soldiers instead of just listing their names. After this, we explored the Lincoln Memorial and then headed back to the bus. We traveled the Drug Enforcement Agency (DEA) to listen to an agent talk about his job and the effect of drugs on our country. All of the questions that students asked the agent afterwards related to marijuana (legalization, medical marijuana, limited use of the drug, etc.). After this we got a quick look at the agency before leaving. We took a tour of Capitol Hill so that we would know where we would be going tomorrow to meet our representatives. We toured the Representative building, where the kids in our group from Nebraska led us to meet one of their state representatives. We went to the Smithsonian Museum of American History. With our group at the museum, we discussed the topic of infrastructure and how it relates to our respective communities. Then we visited the transportation exhibit, which had life-sized trains, cars, facts about transport, etc. After eating dinner and shopping at the Pentagon City Mall, we headed back to the hotel. With our group, we researched the Fair Tax Act and had a debate on whether it should be passed or not. This was practice for our Capitol Hill Simulation, where the whole Close Up group split into six smaller groups to discuss the passing of six different bills. This gave us the chance to act like we were the Congress, discussing the bills, making amendments, and choosing to pass them or not. When we were finished, the entire "Congress" voted on three bills. This concluded the activities for the day, and after a quick meeting and hula practice, here we are writing this post. We can't wait to meet our Senators and Representative tomorrow!